Sound healing is one of the oldest, most gentle and most profound modalities known to man and is now being reintroduced to modern medicine. Doctors have been using sound to break up gall and kidney stones for several years and are now realizing the benefit of sound healing for our organs and for other health-related issues. Similar to how ultrasound identifies solid matter, sound vibrations identify blocks or dissonance in our physical body. 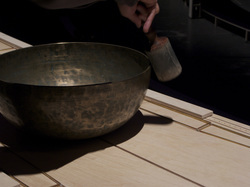 Using voice with intention, Tibetan brass bowls, quartz crystal, tuning forks and more, sound has the capacity to go in deeply, yet gently, bringing ease and restoring wholeness- the root of health. 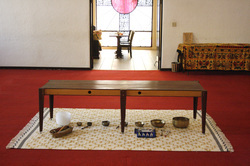 "To experience a vibrational healing with a monochord table is a truly magical and cosmic experience. It not only lifts one to the level of the “Music of the Spheres” it can assist in raising consciousness as well as relaxing and aligning the body. Overtones, known also as harmonics were first discovered in the West over 2600 years ago by Pythagoras. This well known Greek philosopher, mathematician and musician spent years studying sound and vibration. His study of ratios on the monochord led philosophers to believe that these ratios also governed the movement of planets and other cosmic elements. Not only did this provide a link between the world of physical experience and numerical relationships, giving birth to mathematical physics, it explained that all sounds were composed of multiple vibrations or frequencies, not just one, as our ears generally perceive.